“Today yes, the entire country wants to combat corruption and crime in the country.” Honduras President Juan Orlando Hernandez spoke these words, acknowledging the onslaught of demands calling for his resignation. This past weekend saw a growing number of protests and marches organized throughout the country of Honduras, and even #RenunciaJOH on Twitter has been picking up steam. The movement calling for the resignation of Honduras’ current President Juan Orlando Hernandez is growing, and demonstrates that the Honduran people are furious and want answers. Last week, it was discovered that the campaign of the current President of Honduras accepted more than $300 million in diverted funds from the Instituto Hondureño de Seguridad Social (IHSS), basically the Honduran health care system. President Juan Orlando Hernandez met today with designees of a multiparty commission of the National Congress to hear a detailed report on the cases of corruption that the group is investigating, which includes representatives of the legislature. 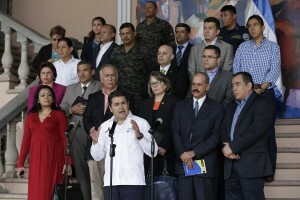 “It has been an exemplary conversation,” the President said, and “I want you to recognize that this work done by the Multiparty Commission is extremely important input in order to move forward.” President Orlando said that he explained to representatives of the judiciary that the delay in the implementation of justice causes a lot of pain, because ultimately, that is injustice. President Orlando stated the National Defense and Security Council will review the suggestions and opinions that the report provides in relation to each institution. One such recommendation the President considered necessary, was to include the issue of supervision of financing political parties in the Money Laundering Act, because “it is fundamental”. The Technical Criminal Investigation Agency [Agencia Técnica de Investigación Criminal (ATIC)] was advised to also meet on the corruption issues. “We also discussed the issue of health in the population and I explained to them that we will soon acquire medicine, with distribution and dispensing of an outsourced manner, but with careful monitoring processes and also using technology,” said the President.